If you are doing the Tarot Blog Hop, odds are that you have arrived from Tarot Notes by Zanna Starr, a nice blog which uses cards from many Tarot decks---for those of us who are always looking for more Tarot decks to buy. And if you are a regualr reader, the post is about a Tarot spread based on an Easter Egg. The prompt for today (tommorrow) Ostra's Tarot Blog Hop is Paint a journey with new life. It was hard not to think of the "coloring the Tarot" exercise that I have done in the course of my Adept Minor ZAM training (Zelator Adept Minor--one of the subgrades that some Golden Dawn Orders use) when presented with this prompt. And being the lazy New Age Adept that I am, I figured "Why not?" 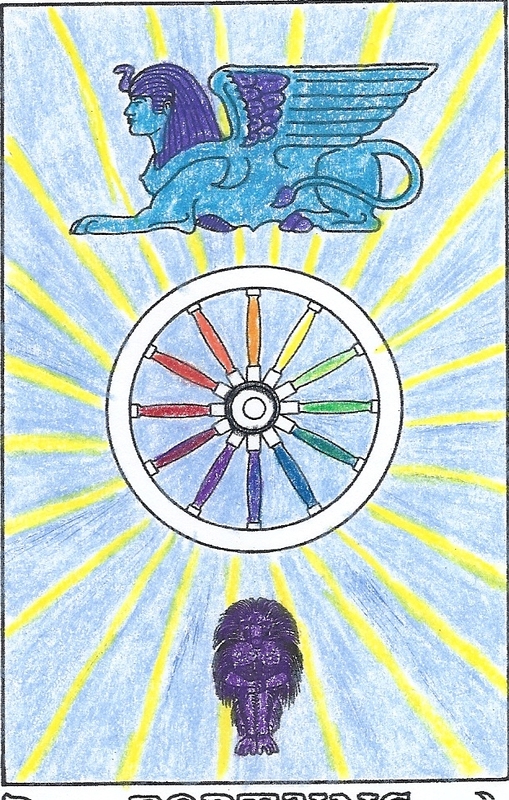 A rough draft of the Wheel of Fortune as colored by the RR et AC. ﻿Now, I will be the first to admit that my results should be buried under a rock. 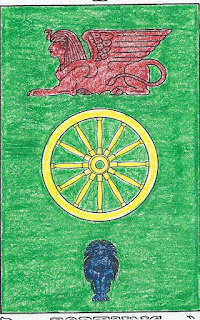 My cards are not the world's prettiest; they are also not the most true when you look at the basis of the color scheme--the color scales of the RR et AC (the original Inner Order of the Golden Dawn, not to be confused with any of the modern Second Orders of the esoteric schools that call themselves Golden Dawn today). 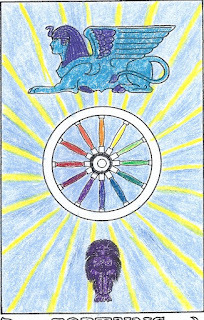 For instance, the Wheel of Fortune should be colored (according to my favorite set of scale sheets) with the colors violet, blue, rich purple, and bright blue rayed with yellow. Even my color blind Dad would have been able to see that my colors are slightly (or greatly) off the mark. The polarities of the Wheel of Fortune card--according to the least reliable GD authority--me! Even more suspect are my private non-canon, non-approved coloring experiments where I just toss out the traditional colors and do whatever I feel like doing. (Suspect in the sense that they are not even remotely what my mentor wanted me to turn out.) One of the coloring experiments that I have indulged in is to attempt to figure out the internal polority of the individual Tarot cards. There would also be a bleed-over when reading the Tarot cards--the part that leaps out at you during a reading could be read in terms of polarity. For instance, if the first thing that leaps out at you during a reading is passive, there is a good chance that the energies of the card are manifesting themselves in that way in the client's life. Now, one of the more easier cards to figure out the polarity for is the Wheel of Fortune (GD/RR et AC version). 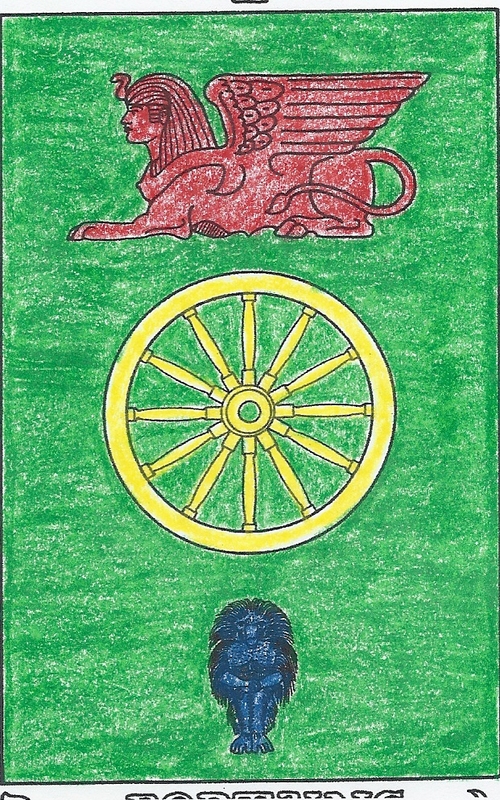 As I have colored it here, red represents the projecting element of the card (the sphinx), the neutral part is yellow (the wheel itself), and the recieving element is blue (the monkey). These are the basic zones of the card. Actually, it may not be as simple as that. All three of these parts can be further subdivided, for they are comprised of symbols that add another layer to the polarity play of the card. For instance, the wheel's spokes actually represent the 12 zodiac signs; therefore, there are both positve and negative elements that comprise the neutral part of the card. Of course, I do not need to tell my regular readers to take this idea with a large grain of salt. This idea is not gospel, rather it is suggestive only. After all, we all know that I got my Golden Dawn certificate out of a cracker jack box and my training in the back of a coffee shop. Ironically, according to some, that makes me the equal of most Golden Dawn leaders and teachers...in which case, feel free to take this as gospel (heavens knows that I am going to inflict it on the members of my own lodge). If you are continuing with the Tarot Blog Hop, you are now going to head over to Johanna Powell Colbert's blog (she is the creator of the Gaian Tarot). Her post is also about an Easter Egg Tarot Spread--obviously, I am the odd one in this particualr Blog Hop. Hi, Morgan! Good to encounter your work as part of the blog hop. I am going to be pondering this idea of the internal polarity of the Major cards for a while. Thank you for a new insight into the cards. 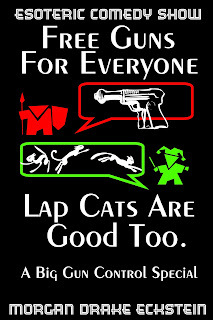 Great and lively post about coming to card polarities on one's own. What I love most about what you are doing is that placing the temple as built within and emanating from the card . . . duality becomes a rather amateur or even a bush-league kind of concept . . . and leaving duality in the dust, your working with polarity sparks the sense of the integrated inner opposites of antinomy to come out and play. Thanks for your Ostara post! How appropriate (for the Ostara Blog Hop theme) and liberating (for those of us who like to color outside the lines)! I look forward to reading more of your wise and witty blog posts! Interesting post. This sentence really struck a cord with me: "For instance, if the first thing that leaps out at you during a reading is passive, there is a good chance that the energies of the card are manifesting themselves in that way in the client's life." I'll start looking at that more closely in my readings as I'm very interested in the vibrational aspects of the Tarot (of which colours play a huge part.) Thanks for sharing. I have half a colored in card somewhere, so kudos to you for sticking with the project! An interesting, cerebral post. Thank you for sharing!